A simple question for all those who have traveled to Japan: how often do you see Japanese people dragging large suitcases behind them? The answer is almost never and this is thanks to an essential Japanese service called takkyubin (or Ta-Q-Bin), which is managed by the Yamato Company. It is the only service of its kind in the world, at least on this scale, a fact that never ceases to surprise the Japanese. After using the service, with its high standards and impeccable punctuality, it is easy to understand why. 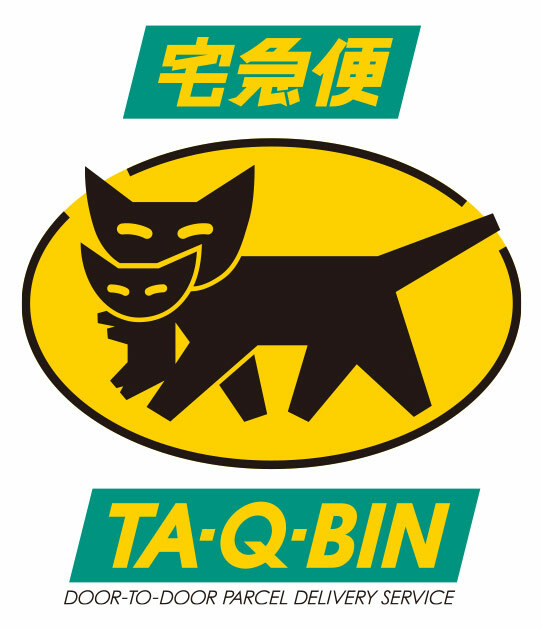 In Japanese, 宅急便 takkyubin means "shipping/fast delivery at home." The service was invented by the Yamato Company during the oil crisis of 1973. The logistics company was founded in 1919, and initially only handled business deliveries. However when the company noticed that Japan Post did not deliver parcels exceeding six kilograms, Yamato began the service in January 1976 with the launch of door-to-door takkyubin. Today, its network is made up of 135,000 employees, 45,000 vehicles and 6,000 warehouses of all sizes (find the nearest) and even today, it complements Japan Post rather than competing with it. Yamato’s job is to deliver parcels very quickly throughout Japan and thanks to a massive local network, the company does so with stunning success. 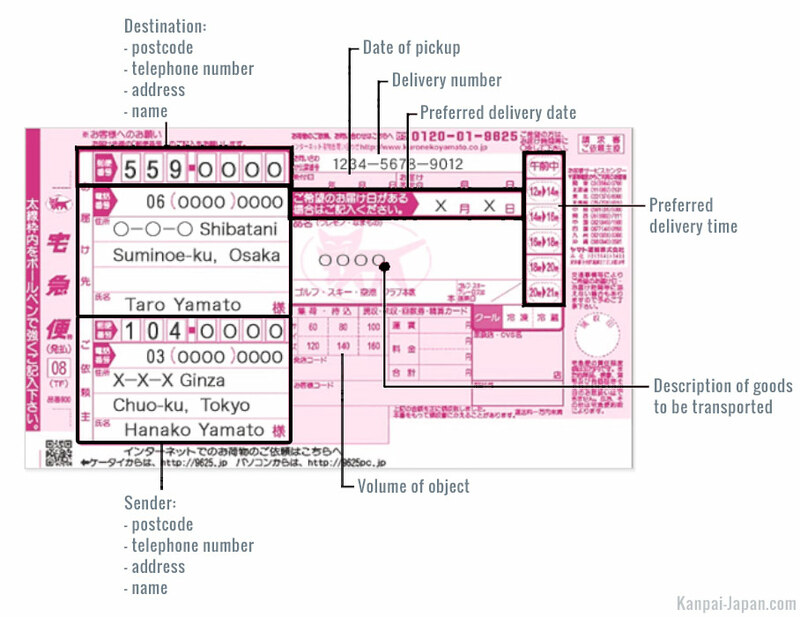 In 2007, Yamato made 1.2 billion deliveries, or 3.3 million packages a day, with a total turnover of 1,000 billion yen! The company promises to pick up your package and deliver it the next day to wherever you want, anywhere in Japan, 365 days a year, so you have almost certainly seen the KuroNeko (Black Cat) vans on the street during your travels. Same-day delivery is even possible for local deliveries. By contrast, delivery to Hokkaido and Okinawa can sometimes take up to two days. In fact, Yamato is so ubiquitous in Japan that its name 宅急便 takkyubin has replaced the common name 宅配便 takuhaibin in everyday language. To be thorough, we must also mention its main competitor Sagawa, although this service is much less used. The cost is reasonable (see below), considering the convenience. To send your item, you must complete a form completely in Japanese. Don’t worry if you don’t speak the language, your hotel's receptionist will give you one (often pre-filled), and fill it in for you. If you are renting private accommodations, ask at the nearest konbini, where someone should be able to help you. If you are not present at the time of delivery, the courier will contact you at the telephone number listed on the form to make a new appointment or will return later in the day. The Japanese Ministry of Tourism has announced that beginning in June 2015, premises offering takkyubin service should display the English "Hands-free travel" logo (see photo) to help foreign tourists. Initially, this logo will mainly appear at airports, but it is expected that its use will extend to many shops as the 2020 Tokyo Olympics approach. The last category is usually the maximum volume allowed by airlines for your checked luggage, so there is a good chance that 160 cm is the range you are looking for in the Yamato fee list (available in PDF - 722ko). For your information, transporting such a suitcase from Tokyo to Kansai (Kyoto, Osaka, etc.) costs ¥1,890 / ~US$ 16.90. Transportation between Hokkaido and Okinawa costs ¥4,520 (~US$ 40.40). For a small suitcase (generally in the 100 cm range) delivered from Fukuoka to Hiroshima, it costs ¥1,160 ~US$ 10.40. It is up to you to work out how much it will cost you to use takkyubin with a currency converter. 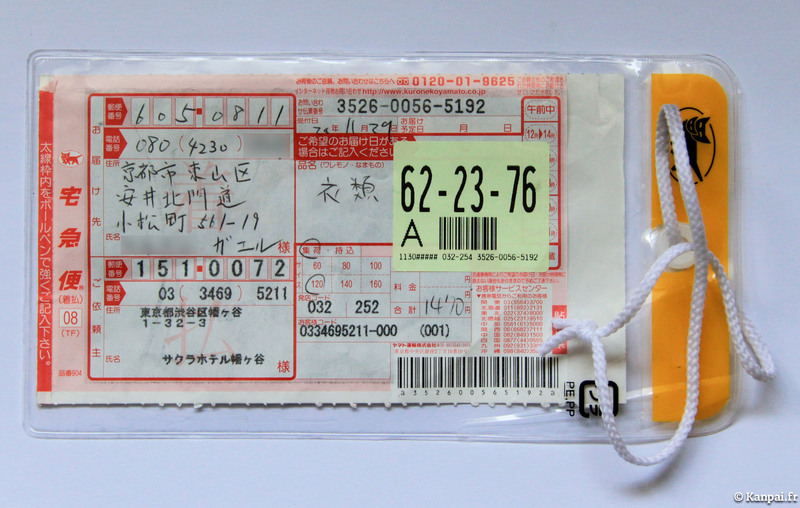 Note that KuroNeko offers a ¥100 (~US$ 0.90) yen discount if you drop the package off at a collection point yourself.